Many people who profess to be Christians are denying Christ daily. The main reason for the denial is that people would rather cherish their life here on earth more than our future life in Heaven. When you realize that everything in this life will burn you won’t want to set your eyes on temporary things. Your life will be more for our eternal God. Below we are going to find out ways to deny Jesus. Jesus Christ is the only way into Heaven and if you don’t accept His loving sacrifice then, you’re denying God. There are many other ways that this can be done as well such as being silent when it’s time to speak up, saying the Bible is fake, living a sinful lifestyle, living a worldly lifestyle, and being ashamed of the Gospel. The consequences of denying Christ is life in hell without parole. Seek wisdom by meditating on the Word of God so you can stand firm and block off Satan’s tricks. When you deny God you are showing cowardice. You will be afraid to do things because you’re a Christian. For example, praying at a restaurant can make you think oh no everybody’s watching me people are going to know I’m a Christian. I’ll just pray with my eyes open so people don’t know. We must watch out for these little alternative things that we do or say to people that in a way is distancing ourselves from Christ. Boldly tell people I’m a Christian. Cherish Christ. He is not only all you need. Jesus Christ is all you have. I cannot imaging anyone looking at the sky and denying God. — Abraham Lincoln. 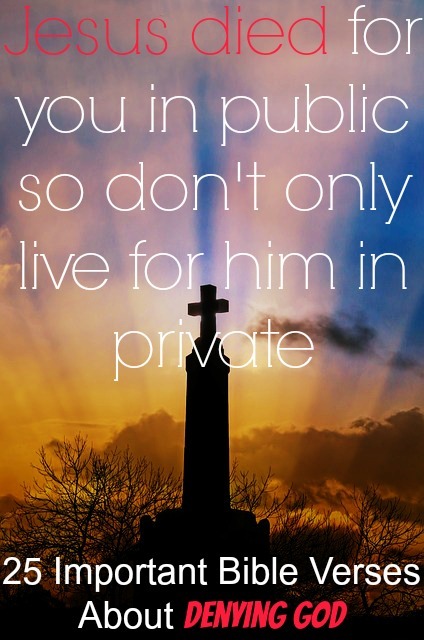 Jesus died for you in public so don’t only live for him in private. 1. John 18:15-27 Simon Peter followed Jesus, as did another of the disciples. That other disciple was acquainted with the high priest, so he was allowed to enter the high priest’s courtyard with Jesus. Peter had to stay outside the gate. Then the disciple who knew the high priest spoke to the woman watching at the gate, and she let Peter in. The woman asked Peter, “You’re not one of that man’s disciples, are you?” “No,” he said, “I am not.” Because it was cold, the household servants and the guards had made a charcoal fire. They stood around it, warming themselves, and Peter stood with them, warming himself. Inside, the high priest began asking Jesus about his followers and what he had been teaching them. Jesus replied, “Everyone knows what I teach. I have preached regularly in the synagogues and the Temple, where the people gather. I have not spoken in secret. Why are you asking me this question? Ask those who heard me. They know what I said.” Then one of the Temple guards standing nearby slapped Jesus across the face. “Is that the way to answer the high priest?” he demanded. Jesus replied, “If I said anything wrong, you must prove it. But if I’m speaking the truth, why are you beating me?” Then Annas bound Jesus and sent him to Caiaphas, the high priest. Meanwhile, as Simon Peter was standing by the fire warming himself, they asked him again, “You’re not one of his disciples, are you?” He denied it, saying, “No, I am not.” But one of the household slaves of the high priest, a relative of the man whose ear Peter had cut off, asked, “Didn’t I see you out there in the olive grove with Jesus?” Again Peter denied it. And immediately a rooster crowed. There are many people who believe there is a God, but deny Jesus as their Savior and they deny who He is. 2. 1 John 4:1-3 Dear friends, do not believe everyone who claims to speak by the Spirit. You must test them to see if the spirit they have comes from God. For there are many false prophets in the world. This is how we know if they have the Spirit of God: If a person claiming to be a prophet acknowledges that Jesus Christ came in a real body, that person has the Spirit of God. But if someone claims to be a prophet and does not acknowledge the truth about Jesus, that person is not from God. Such a person has the spirit of the Antichrist, which you heard is coming into the world and indeed is already here. 3. 1 John 2:22-23 And who is a liar? Anyone who says that Jesus is not the Christ. Anyone who denies the Father and the Son is an antichrist. Anyone who denies the Son doesn’t have the Father, either. But anyone who acknowledges the Son has the Father also. 4. 2 John 1:7 I say this because many deceivers have gone out into the world. They deny that Jesus Christ came in a real body. Such a person is a deceiver and an antichrist. 5. John 14:6 Jesus saith unto him, I am the way, the truth, and the life: no man cometh unto the Father, but by me. It’s not cool to be a Christian. When you are ashamed of God, you are denying the Lord. When it’s time to speak up and you remain silent that is denial. If you never share Christ with your friends or never witness to the lost that is denial. Being a coward will take you to hell. 7. Matthew 10:31-33 So don’t be afraid; you are more valuable to God than a whole flock of sparrows. “Everyone who acknowledges me publicly here on earth, I will also acknowledge before my Father in heaven. But everyone who denies me here on earth, I will also deny before my Father in heaven. 8. 2 Timothy 2:11-12 This is a trustworthy saying: If we die with him, we will also live with him. If we endure hardship, we will reign with him. If we deny him, he will deny us. 9. Luke 9:25-26 And what do you benefit if you gain the whole world but are yourself lost or destroyed? If anyone is ashamed of me and my message, the Son of Man will be ashamed of that person when he returns in his glory and in the glory of the Father and the holy angels. 10. Luke 12:9 But anyone who denies me here on earth will be denied before God’s angels. 11. Matthew 10:28 “Don’t be afraid of those who want to kill your body; they cannot touch your soul. Fear only God, who can destroy both soul and body in hell. You deny God by living in hypocrisy. Faith that doesn’t change your life is dead. If you say you are a Christian, but you are living in rebellion, you are a liar. You have never been converted. You have never repented of your sins. Are you denying God by your lifestyle. 12. Titus 1:16 They claim to know God, but by their actions they deny him. They are detestable, disobedient and unfit for doing anything good. 13. 1 John 1:6 If we claim to have fellowship with him and yet walk in the darkness, we lie and do not live out the truth. 14. 1 John 3:6-8 No one who remains in union with him keeps on sinning. The one who keeps on sinning hasn’t seen him or known him. Little children, don’t let anyone deceive you. The person who practices righteousness is righteous, just as the Messiah is righteous. The person who practices sin belongs to the evil one, because the Devil has been sinning from the beginning. The reason that the Son of God was revealed was to destroy what the Devil has been doing. 15. Jude 1:4 For certain individuals whose condemnation was written about long ago have secretly slipped in among you. They are ungodly people, who pervert the grace of our God into a license for immorality and deny Jesus Christ our only Sovereign and Lord. 16. Matthew 7:21-23 Not every one that saith unto me, Lord, Lord, shall enter into the kingdom of heaven; but he that doeth the will of my Father which is in heaven. Many will say to me in that day, Lord, Lord, have we not prophesied in thy name? and in thy name have cast out devils? and in thy name done many wonderful works? And then will I profess unto them, I never knew you: depart from me, ye that work iniquity. Saying there is no God. 17. Psalm 14:1 Only fools say in their hearts, “There is no God.” They are corrupt, and their actions are evil; not one of them does good! Being like the world. Always trying to be a friend of the world and fit in with the world instead of fitting out. If none of your friends know that you are a Christian something is wrong. 18. James 4:4 Ye adulterers and adulteresses, know ye not that the friendship of the world is enmity with God? whosoever therefore will be a friend of the world is the enemy of God. 19. 1 John 2:15-16 Love not the world, neither the things that are in the world. If any man love the world, the love of the Father is not in him. For all that is in the world, the lust of the flesh, and the lust of the eyes, and the pride of life, is not of the Father, but is of the world. 20. Romans 12:2 And be not conformed to this world: but be ye transformed by the renewing of your mind, that ye may prove what is that good, and acceptable, and perfect, will of God. You deny God by denying God’s Word. We must never add, take away from, or twist Scripture. 21. John 12:48-49 There is a judge for the one who rejects me and does not accept my words; the very words I have spoken will condemn them at the last day. For I did not speak on my own, but the Father who sent me commanded me to say all that I have spoken. 22. Galatians 1:8 But even if we or an angel from heaven should preach a gospel other than the one we preached to you, let them be under God’s curse! 23. 2 Peter 1:20-21 Above all, you must understand that no prophecy of Scripture came about by the prophet’s own interpretation of things. For no prophecy was ever produced by the will of man, but men spoke from God as they were carried along by the Holy Spirit. If you’re going to deny someone then, deny yourself. 24. Matthew 16:24-25 Then Jesus said to his disciples, “If any of you wants to be my follower, you must turn from your selfish ways, take up your cross, and follow me. If you try to hang on to your life, you will lose it. But if you give up your life for my sake, you will save it. 25. Isaiah 59:13 We know we have rebelled and have denied the LORD. We have turned our backs on our God. We know how unfair and oppressive we have been, carefully planning our deceitful lies. Next: Is Wearing Makeup A Sin?